Coconut Cake has always been one of those baked goods I felt like you had to be a good baker to make. I have been doing more and more baking recently and felt like I wanted a challenge. 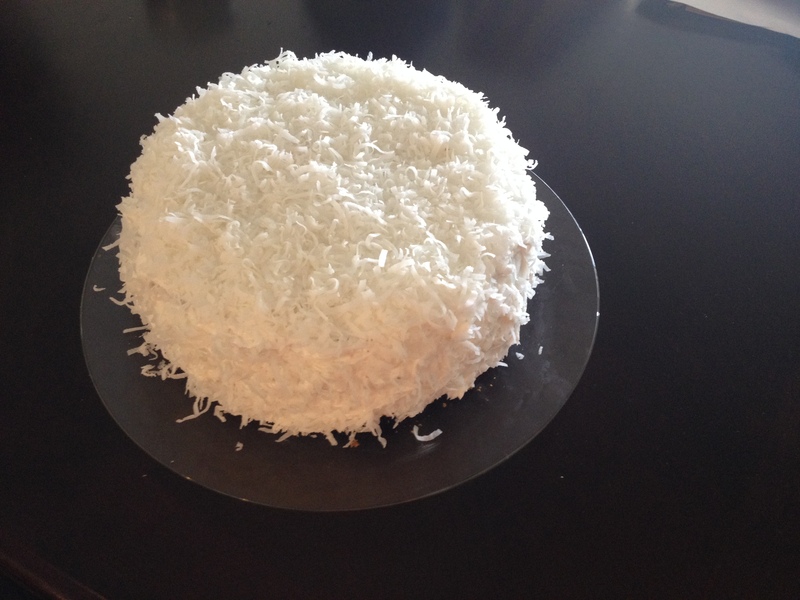 This weekend, I took the challenge and made my first ever Coconut Cake. I wasn’t afraid of the cake, it is relatively simple, a 1-2-3-4 cake that substitutes coconut milk for regular milk. My worry came with the icing, I had never used a double-boiler , but thankfully all went well and the cake was a success. For some reason it didn’t rise as much as I thought it would, but all in all I am happy with my first attempt. Follow directions for Basic 1-2-3-4 Cake, substituting coconut milk for regular milk. While cake is baking, prepare filling. Stir together sugar, sour cream, milk, and coconut in a bowl until well blended. Remove cake layers from oven and allow cake to remain in pans as you prepare to stack and fill. Remove first layer and invert onto cake plate. Using the wrong end of a wooden spoon, poke holes approximately 1-inch apart until entire cake has been poked. Spread 1/3 of filling mixture on cake layer. Top with second layer, repeat process. Top with last layer and repeat process again. (As I stack layers together I stick them with toothpicks to prevent cake from shifting). Prepare 7-Minute Frosting. Frost top and sides of cake. Sprinkle top and sides of cakes with additional coconut. Grease and flour 3 (9-inch) cake pans. Using an electric mixer, cream butter until fluffy. Add sugar and continue to cream well for 6 to 8 minutes. Add eggs, 1 at a time, beating well after each addition. Add flour and milk alternately to creamed mixture, beginning and ending with flour. Add vanilla and continue to beat until just mixed. Divide batter equally among prepared pans. Level batter in each pan by holding pan 3 or 4 inches above counter, then dropping it flat onto counter. Do this several times to release air bubbles and assure you of a more level cake. Bake for 25 to 30 minutes or until done. Cool in pans 5 to 10 minutes. Invert cakes onto cooling racks. Cool completely and spread cake layers with your favorite frosting to make a 3-layer cake. Place sugar, cream of tartar or corn syrup, salt, water, and egg whites in the top of a double boiler. Beat with a handheld electric mixer for 1 minute. Place pan over boiling water, being sure that boiling water does not touch the bottom of the top pan. (If this happens, it could cause your frosting to become grainy). Beat constantly on high-speed with electric mixer for 7 minutes. Beat in vanilla.